As the holiday season approaches we thought it was a good moment to update you on some grants we're making to support education, technology and the fight against modern day slavery. Science, technology, engineering and math (STEM) open up great opportunities for young people so we've decided to fund 16 great programs in this area. These include Boston-based Citizen Schools and Generating Genius in the U.K., both of which work to help to expand the horizons of underprivileged youngsters. In total, our grants will provide enhanced STEM education for more than 3 million students. In addition, we're supporting girls’ education in the developing world. By giving a girl an education, you not only improve her opportunities, but those of her whole family. The African Leadership Academy provides merit scholarships to promising young women across the continent, and the Afghan Institute of Learning offers literacy classes to women and girls in rural Afghanistan. Groups like these will use our funds to educate more than 10,000 girls in developing countries. Modern day slavery is a multi-billion dollar industry that ruins the lives of around 27 million people. So we're funding a number of groups that are working to tackle the problem. For instance, in India, International Justice Mission (IJM), along with The BBC World Service Trust, Action Aid and Aide et Action, are forming a new coalition. It will work on the ground with governments to stop slave labor by identifying the ring masters, documenting abuse, freeing individuals and providing them with therapy as well as job training. Our support will also help expand the reach of tools like the powerful Slavery Footprint calculator and Polaris Project’s National Trafficking Hotline. These grants, which total $40 million, are only part of our annual philanthropic efforts. Over the course of the year, Google provided more than $115 million in funding to various nonprofit organizations and academic institutions around the world; our in-kind support (programs like Google Grants and Google Apps for Education that offer free products and services to eligible organizations) came to more than $1 billion, and our annual company-wide GoogleServe event and related programs enabled individual Googlers to donate more than 40,000 hours of their own volunteer time. As 2011 draws to a close, I’m inspired by this year’s grantees and look forward to seeing their world-changing work in 2012. From intellectual property enforcement, to patents, to free expression, policy makers are focused on the web. We’re excited to launch the 5th summer of the Google Policy Fellowship, connecting students of all levels and disciplines with organizations working on the forefront of these and other critical issues for the future of the Internet. Applications are open today, and the deadline to apply is February 3, 2012. Selected students will spend ten weeks this summer working on a broad portfolio of topics at a diverse set of organizations, including: American Library Association, Canadian Internet Policy and Public Interest Clinic, Center for Democracy and Technology, The Citizen Lab, Competitive Enterprise Institute, Creative Commons, Electronic Frontier Foundation, Future of Music Coalition, Internet Education Foundation, Joint Center for Political and Economic Studies, Media Access Project, National Hispanic Media Coalition, New America Foundation, Public Knowledge, TechFreedom, and Technology Policy Institute. Editor’s note: In parallel with the Big Tent event in the Hague, earlier today we partnered with the Royal Netherlands Embassy in Washington, DC to hold a seminar on internet freedom at the Newseum. Our answer was to hook up with the Dutch NGO Free Press Unlimited and host one of our Big Tent events, which aim to bring together corporations, civil society and politicians. We were delighted when both U.S. Secretary of State Hillary Clinton and Minister Rosenthal agreed to take part. Our Executive Chairman Eric Schmidt welcomed them to the Fokker Terminal in The Hague. “We are joined in a spirit to fight people who want to shut down free speech," he said. "It makes easy sense for a government to say: 'We don't like that...we're going to censor it'.” The conference, he said, was organized "to make the point that this is not right." This morning Google copyright policy counsel Katherine Oyama will testify before the House Judiciary Committee on the Stop Online Piracy Act. You can read her written and her oral testimony. We strongly support the goal of the bill -- cracking down on offshore websites that profit from pirated and counterfeited goods -- but we’re concerned the way it’s currently written would threaten innovation, jobs, and free expression. We are not alone in our concerns. Earlier this week, we joined eight other Internet companies -- AOL, eBay, Facebook, LinkedIn, Mozilla, Twitter, Yahoo!, and Zynga -- in a letter to Congress, echoing concerns voiced by industry associations, entrepreneurs, small business owners, librarians, law professors, venture capitalists, human rights advocates, cybersecurity experts, public interest groups, and tens of thousands of private citizens. Google takes the problem of online piracy and counterfeiting very seriously, devoting our best engineering talent and tens of millions of dollars every year to combat it through our Content ID system on YouTube, our efforts to make copyright work better online, and our work to keep counterfeiters out of our ads system. Katherine’s testimony will offer recommendations for more targeted ways to combat foreign “rogue” websites that are dedicated to copyright infringement and trademark counterfeiting, while preserving the innovation and dynamism that has made the Internet such an important driver of economic growth and job creation. Starting today, we'll begin cross-posting some entries from our Inside Search blog to help pull back the curtain even further on how Google search works. We hope to provide greater transparency by posting regular updates about our major search ranking changes. Today we’re continuing our long-standing series of blog posts to share the methodology and process behind our search ranking, evaluation and algorithmic changes. This summer we published a video that gives a glimpse into our overall process, and today we want to give you a flavor of specific algorithm changes by publishing a highlight list of many of the improvements we’ve made over the past couple weeks. 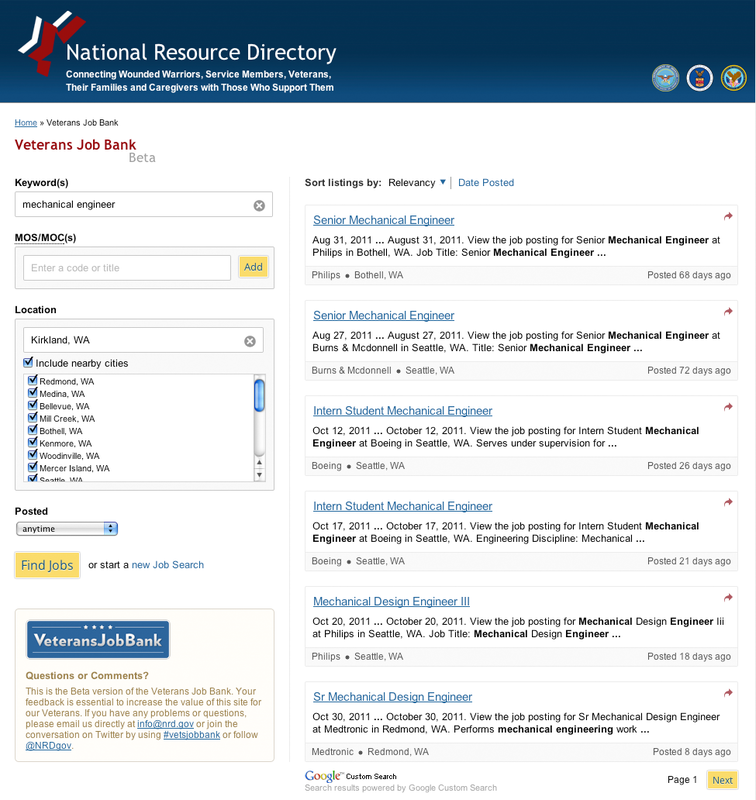 We have been working with the U.S. Department of Veterans Affairs to provide a customized job search engine for the NRD, using Google Custom Search technology. This custom search engine uses the power and scale of Google search to constantly crawl the web, looking for JobPosting markup from Schema.org on sites like simplyhired.com to identify veteran-committed job openings. An employer can easily add a job posting to NRD simply by adding that markup to their own web page. As pages are updated or removed from the web, they’re automatically updated and removed from the system, keeping the available job postings on NRD fresh and up to date. If you’re an employer, you can find more information on how to participate on nationalresourcedirectory.gov. In addition, organizations such as local veterans' groups can help people find jobs by adding a veteran-committed jobs search box to their websites. We’re happy to contribute to this important initiative and hope businesses use this opportunity to connect with veterans seeking employment. Last week, Google launched the “Chrome for Wounded, Ill and Injured Warriors” program in partnership with the American Red Cross Service to the Armed Forces. Google has donated 600 Chromebooks to the Red Cross for exclusive use by wounded, ill and injured warriors during their recovery at five polytrauma centers. To kick off the program, 20 members of the Google Veterans Network, our employee resource group dedicated to veterans’ issues, paid a visit to some friends over at Walter Reed National Military Medical Center in Bethesda, MD. We delivered 275 of the Chromebooks and led one-on-one training over the course of two days with warriors, their family members, hospital staff, and Red Cross volunteers. We realize that technology plays a huge role in staying in touch with friends and family, and we hope that these Chromebooks will help our wounded, ill and injured warriors do just that. For many of these soldiers, sailors, Marines, airmen, and coasties, emailing, chatting, calling, and video are a primary connection point to family and friends spread across the world. An additional 325 Chromebooks have been distributed to Red Cross stations at Fort Belvoir Community Hospital, Womack Army Medical Center, Navy Medical Center San Diego and Landstuhl Regional Medical Center. We are proud to partner with the American Red Cross on this initiative. Take a minute to check out the blog post from the Red Cross about the visit. How do governments affect access to information on the Internet? To help shed some light on that very question, last year we launched an online, interactive Transparency Report. All too often, policy that affects how information flows on the Internet is created in the absence of empirical data. But by showing traffic patterns and disruptions to our services, and by sharing how many government requests for content removal and user data we receive from around the world, we hope to offer up some metrics to contribute to a public conversation about the laws that influence how people communicate online. We believe that providing this level of detail highlights the need to modernize laws like the Electronic Communications Privacy Act, which regulates government access to user information and was written 25 years ago—long before the average person had ever heard of email. Yet at the end of the day, the information that we’re disclosing offers only a limited snapshot. We hope others join us in the effort to provide more transparency, so we’ll be better able to see the bigger picture of how regulatory environments affect the entire web. When someone uses Google to search, it’s our job to provide them with answers. We’ve come a long way in developing search technology that delivers the most relevant results for our users, but there are still some answers that are difficult to find and provide. This became painfully clear during the health care debate last year. In the space of a few weeks, we had a sharp increase in search queries about the health care bill or a specific provision of the legislation. Unfortunately, we couldn’t provide the best information to our users simply because a lot of congressional information isn’t readily available in a digital format. Congress and members of Congress share information in a lot of modern ways through Twitter, Facebook, and on the web, but some congressional data sharing processes are older than Congress itself, as groups like the Sunlight Foundation have pointed out. Last week, Karen Haas, the Clerk for the House of Representatives, changed the game dramatically. She led an effort to update the Clerk’s legislative activities page so that it now includes a huge amount of browsable — and searchable — information. The new features include detailed summaries of daily floor action, what bills were debated and introduced each day (with links to the full text of the bill) and a detailed summary of every vote. In addition, each “house floor proceedings” page now includes archived video from the House floor and a detailed XML file for each day’s activity so that web developers and others can use and share this information. The House of Representatives has demonstrated great leadership on this project. We look forward to using this congressional data to improve Google Search now and in the future as the congressional commitment to open government expands. Last week, 17-year-old Shree Bose from Fort Worth, Texas, the grand prize winner of the Google Science Fair, visited Washington, D.C. at the invitation of the White House. We invited Shree to write about her experience in the capital. - Ed. Adrenaline. I turned around as the brilliantly polished door behind me opened, and suddenly I was face to face with a man I’d seen so many times on television. 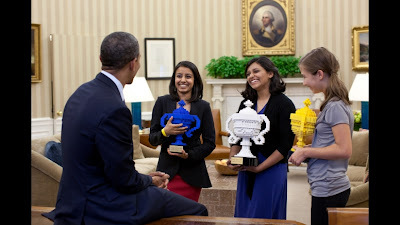 The President of the United States calmly extended his hand to shake mine and those of Naomi and Lauren, the other two winners of Google’s first-ever Science Fair. He knew about our projects and was genuinely excited to talk with us. The Oval Office is more than just a room. It has a palpable aura of grandeur, with the presidential seal in the center of the deep blue carpet and a portrait of George Washington hanging on the wall. The desk, where presidents of the past have contemplated some of the most important decisions in the world’s history, was polished to a gleam. President Obama leaned against it as he talked to us. He asked us how we became interested in science, what our plans were for the future and which colleges we were interested in. Smiling, he told us to stick with science. We left the Oval Office feeling like our individual futures were important to the nation’s future; like we could change the world. Our trip to Washington, D.C., also included visits to the National Institute of Health, the Environmental Protection Agency and the U.S. Department of Agriculture. Over our two days, we were given the opportunity to sit down and talk with many of our country’s leaders who have not only been extraordinarily successful in the fields we wish to go into in the future, but who also encouraged us to follow our own dreams. It was more than just meetings; it was inspiration. On the Internet, as with the offline world, the choices we make often have an impact on others. The links we share and the sites we visit can affect our security and sometimes introduce risk for people we know. Given how quickly our collective use of technology is evolving, it’s useful to periodically remind ourselves of practices that can help us achieve a more secure and enjoyable online experience. This month, Google once again joins the National Cyber Security Alliance (NCSA), government agencies, corporations, schools and non-profit organizations in recognizing National Cyber Security Awareness Month. It’s a time for us to offer education that increases online security for everyone. It’s fitting that the theme of this year’s Cyber Security Awareness Month is “Our Shared Responsibility.” With ever-increasing ways to access the web and share information, we need to focus on keeping our activities secure. In that spirit, and to help kick off Cyber Security Awareness Month, we’re introducing a new Google Security Center. The Security Center is full of practical tips and information to help people stay safe online, from choosing a secure password to using 2-step verification and avoiding phishing sites and malware. We also continue to develop products and services that help people protect their information online. Examples that have stood out so far this year include the Chromebook, 2-step verification in 40 languages, and Chrome browser warnings for malicious downloads and out-of-date plugins, among others. We develop free products and tools such as DOM Snitch, a Chrome extension that helps developers identify insecure code. We recognize the importance of security education and are committed to helping make your online experience both exciting and safe to use. We all have a responsibility to take steps to protect ourselves and together develop a culture of security. We encourage everyone to Stop. Think. Connect. E-book sales are booming, creating new opportunity for authors and publishers. E-books have also fundamentally changed the way that readers discover and access books, opening vast libraries and making them available in the cloud via Google Books and other providers. But the laws governing your rights as a reader haven’t evolved nearly as quickly. Forty-eight states have special “books laws” that limit when the government can compel disclosure of records regarding your book buying and reading. It’s not always clear, however, to what extent such laws apply to booksellers, including online stores. It’s important that our laws reflect the way people live their lives today. That’s why we’re pleased to see that California signed into law the Reader Privacy Act, which clarifies the law and ensures that there are high standards before booksellers -- whether they’re selling print or digital books -- can be compelled to turn over reading records. This law takes a careful, balanced approach, protecting readers’ privacy while allowing for legitimate law enforcement access with a warrant or under specific, narrow exceptions. This bill was sponsored by Sen. Leland Yee, championed by the ACLU of Northern California and Electronic Frontier Foundation, and supported by a number of others, including Google. We believe that our laws should protect individuals from unwarranted government intrusion in the online world no less than they do in the home, library, or bookstore, even as information and computing technology continue to advance. This is why we already invoke existing “books laws” when necessary to protect readers’ privacy, and why we’ve backed laws at the federal level to update the rules that protect your data stored in the cloud. Since we announced our plans to acquire Motorola Mobility, we've been excited about the positive reaction to the proposed deal -- particularly from our partners who have told us that they're enthusiastic about our defense of the Android ecosystem. And as David Drummond said when we announced our plans in August, we're confident that this deal will be approved. We believe very strongly this is a pro-competitive transaction that is good for Motorola Mobility, good for consumers, and good for our partners. While this means we won't be closing right away, we're confident that the DOJ will conclude that the rapidly growing mobile ecosystem will remain highly competitive after this deal closes. We'll be working closely and cooperatively with them as they continue their review. This afternoon at 2 PM E.T., Eric Schmidt will testify before the U.S. Senate to talk about Google’s approach to competition. He will deliver a simple message: we welcome competition. It makes us better. It makes our competitors better. Most importantly, it means better products for our users. The hearing will be webcast and you can read his written and his oral testimony. In December, we announced four initiatives to tackle the problem of copyright infringement online. We’ve made considerable progress on each front, and we will continue to evolve our efforts in all four areas in the months to come. Acting on reliable copyright takedown requests within 24 hours. We promised to build tools to make it easier for rightsholders to submit DMCA takedown requests for Google products (starting with Blogger and Web Search), and to reduce our average response time to 24 hours or less for submissions using these new tools. We built the tools earlier this year, and they are now being successfully used by more than a dozen content industry partners who together account for more than 75% of all URLs submitted in DMCA takedowns for Web Search. Our response time for these partners is now well below the 24 hour target. In the coming months, we will be making these tools available more broadly to those who have established a track record of submitting valid takedown requests. Preventing terms that are closely associated with piracy from appearing in Autocomplete. Beginning in January, we started filtering terms closely associated with infringement from Google Autocomplete, our feature that predicts search queries based on popular searches from other users. Improving our AdSense anti-piracy review. We have always prohibited the use of our AdSense program on web pages that provide infringing materials, and we routinely terminate publishers who violate our policies. In recent months, we have worked hard to improve our internal enforcement procedures. In April, we were among the first companies to certify compliance in the Interactive Advertising Bureau’s (IAB’s) Quality Assurance Certification program, through which participating advertising companies will take steps to enhance buyer control over the placement and context of advertising and build brand safety. In addition, we have invited rightsholder associations to identify their top priority sites for immediate review, and have acted on those tips when we have received them. Improving visibility of authorized preview content in search results. We have launched Music Rich Snippets, which allow legitimate music sites to highlight content in the snippets that appear in Google’s Web Search results. Rhapsody and MySpace are among the first to implement this feature, which has been developed using open web markup standards, and we are looking forward to more sites and search engines marking up their pages. We hope that authorized music sites will take advantage of Music Rich Snippets to make their preview content stand out in search results. These four initiatives have been an important part of our work combating piracy these last several months, but we’ve been pursuing other avenues as well. We continue to believe that making high-value content available in authorized forms is a crucial part of the battle against online infringement. We have expanded our movie rental services on YouTube and launched the Google eBookstore, featuring a wide array of books from authors and publishers. We also continue to improve YouTube’s Content ID system to help more copyright owners (including song-writers and music publishers) to monetize their works and are working with WIPO on a rights registry that will help African musicians license their works. There is plenty more to be done, and we look forward to further refining and improving our processes in ways that help both rightsholders and users. Over the past few years, we’ve released a series of blog posts to share the methodology and process behind our search ranking, evaluation and algorithmic changes. Just last month, Ben Gomes, Matt Cutts and I participated in a Churchill Club event where we discussed how search works and where we believe it’s headed in the future. Beyond our talk and various blog posts, we wanted to give people an even deeper look inside search, so we put together a short video that gives you a sense of the work that goes into the changes and improvements we make to Google almost every day. While an improvement to the algorithm may start with a creative idea, it always goes through a process of rigorous scientific testing. Simply put: if the data from our experiments doesn’t show that we’re helping users, we won’t launch the change. 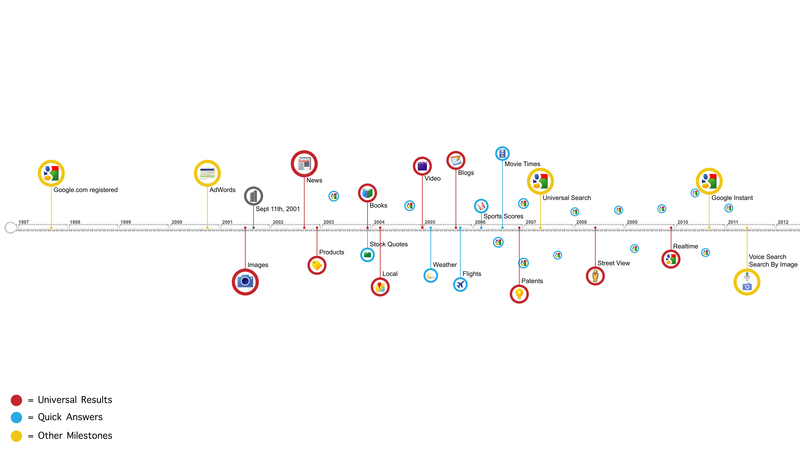 In the world of search, we’re always striving to deliver the answers you’re looking for. After all, we know you have a choice of a search engine every time you open a browser. As the Internet becomes bigger, richer and more interactive it means that we have to work that much harder to ensure we’re unearthing and displaying the best results for you. This blogpost includes forward-looking statements within the meaning of Section 27A of the Securities Act of 1933 and Section 21Eof the Securities Exchange Act of 1934. These forward-looking statements generally can be identified by phrases such as Google or management “believes,” “expects,” “anticipates,” “foresees,” “forecasts,” “estimates” or other words or phrases of similar import. Similarly, statements herein that describe the proposed transaction, including its financial impact, and other statements of management’s beliefs, intentions or goals also are forward-looking statements. It is uncertain whether any of the events anticipated by the forward-looking statements will transpire or occur, or if any of them do, what impact they will have on the results of operations and financial condition of the combined companies or the price of Google or Motorola stock. These forward-looking statements involve certain risks and uncertainties that could cause actual results to differ materially from those indicated in such forward-looking statements, including but not limited to the ability of the parties to consummate the proposed transaction and the satisfaction of the conditions precedent to consummation of the proposed transaction, including the ability to secure regulatory approvals at all or in a timely manner; the ability of Google to successfully integrate Motorola’s operations, product lines and technology; the ability of Google to implement its plans, forecasts and other expectations with respect to Motorola’s business after the completion of the transaction and realize additional opportunities for growth and innovation; and the other risks and important factors contained and identified in Google’s filings with the Securities and Exchange Commission (the "SEC"), any of which could cause actual results to differ materially from the forward-looking statements. The forward-looking statements included in this press release are made only as of the date hereof. Google undertakes no obligation to update the forward-looking statements to reflect subsequent events or circumstances.